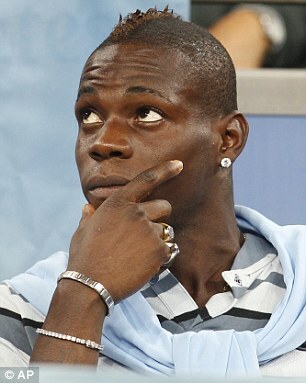 Manchester City striker, Mario Balotelli has had another bust-up with boss Roberto Mancini over his lifestyle. Balotelli was left out of the squad for Tuesday's Champions League defeat at Real Madrid. Mancini is fed up with Balotelli's wild ways including his smoking habit and is fast losing patience with the maverick Italian. Balotelli partied until the early hours after Saturday's 1-1 draw at Stoke. He was pictured with boxer Amir Khan on a night out at Circle Club in Manchester. Mancini was angry as he wanted Balotelli to rest after the Stoke match ahead of their opening European match against the Spanish giants. As a punishment, Balotelli was forced to travel to the Bernabeu despite being told he wouldn't play a part before stepping on the plane. 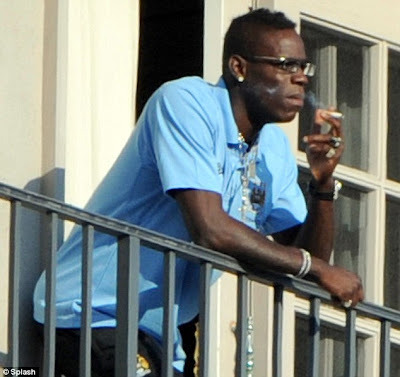 Another growing concern for Mancini is Balotelli's smoking habit - infuriating for a club that pay him over £100,000 per week. Although it is not known just how much Balotelli smokes, he has regularly been pictured puffing on a cigarette away from his job. Mancini has been left frustrated at Balotelli's refusal to have counselling sessions or hypnosis to help kick the habit.